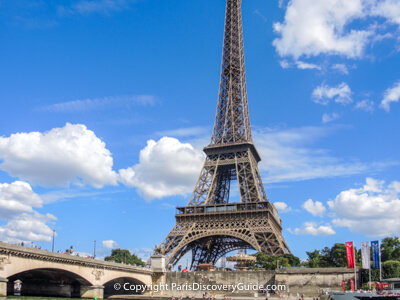 Don't Leave Paris without Seeing these Famous Sights & Places! 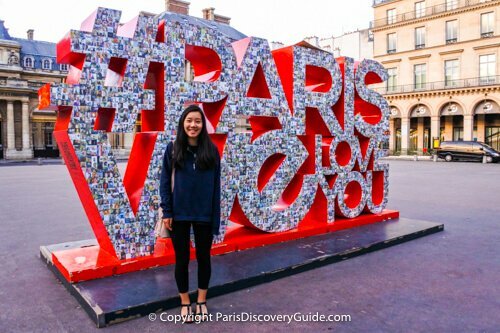 Planning your first visit to Paris? If so, start with these top 10 attractions and legendary sightseeing destinations. These are the historical, cultural, and famous places everyone associates with Paris. Don't feel you need to visit all of them in one visit, especially you are here for just a few days. Several, such as the soaring Eiffel Tower, the gorgeous Seine River, the monumental Arc de Triomphe, and even the gleaming white Sacre Coeur set high on a hilltop, are part of the Paris skyline and easy to spot from many places in the city, whether or not you actually visit. 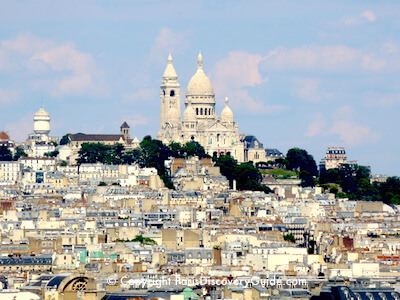 But do take time to stroll through an iconic neighborhood such as the Latin Quarter or Montmartre. Relax in the beautiful Luxembourg Garden. 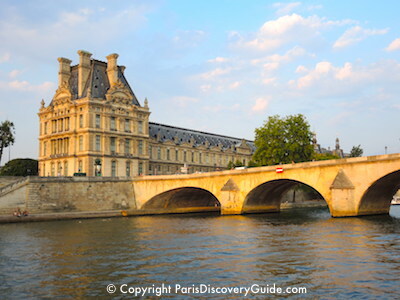 Take sunset cruise along the Seine. 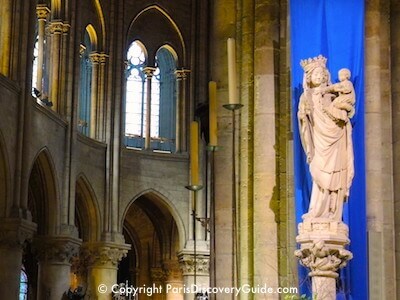 Spend even a few moments inside Notre Dame (entrance is free) and admire the stunning stained glass - the South and North Rose Windows date back to the 13th century. 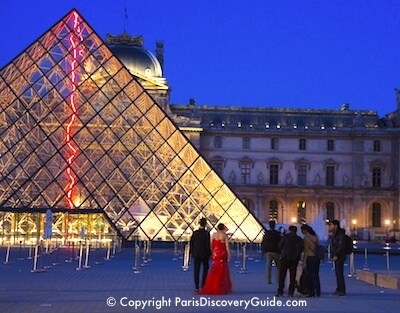 And plan a visit to at least one of the most famous Paris museums and experience their masterpieces in person. See the Mona Lisa and Venus de Milo at the Louvre, Van Gogh's Starry Night at the Orsay, or cutting-edge contemporary art at Pompidou. Finally, save some time to see other less famous and even "hidden" attractions in Paris, even if it means skipping some of the places on this page. You can always visit on your next trip to Paris, and meanwhile, you'll have a variety of wonderful memories. Because as Ernest Hemingway famously said, " . . . wherever you go for the rest of your life it stays with you, for Paris is a moveable feast." Soaring high above the Paris landscape, the Eiffel Tower symbolizes Paris - and gives you spectacular city views from three levels. Although you can see the famous landmark from many points in the city, nothing beats the thrill of going up to the observation platforms and watching the Paris landscape get smaller and smaller below you. More to Enjoy: Restaurants and a champagne bar, a seasonal ice skating rink, great views through the transparent floor on the 1st level. Paris Discovery Tip: Crowds at the Eiffel Tower can be massive and waiting in line to get tickets can take up to 4 hours or more during peak months - but if you plan in advance, you can breeze right in. Built during the Middle Ages at the historic heart of Paris, Notre Dame Cathedral embodies the splendors of Gothic architecture. From the outside, you can admire the high towers, flying buttresses, and ornate carvings and numerous statues of saints and martyrs along the sides. Inside, light streams in through spectacular stained glass windows. You can wander around and admire the hundreds of statues, sculptures, and paintings. More to Enjoy: Climb up to the tower for a close-up look at the cathedral's famous gargoyles and some of the best views of Paris. Experience Notre Dame's magnificent organ by attending an evening concert. Paris Discovery Tip: If the weather is good, walk around the outside of the cathedral to the lovely gardens on the south and east sides. The enormous Louvre Museum receives over 10 million visitors a year, making it the world's most visited museum and a top Paris attraction. This is partly due to the Louvre's two uber-famous masterworks, di Vinci's Mona Lisa and the ancient Greek statue, Venus de Milo. But there's so much more here to see, including a magnificent Egyptian collection complete with mummies, and gallery after gallery of European paintings from the Middle Ages to the mid-19th century. Outside, glass pyramids and a reflecting pool contrast with the ornate Renaissance architecture of the former palace. More to Enjoy: At basement level, you can view excavations of the original 12th century fortress that occupied this location. 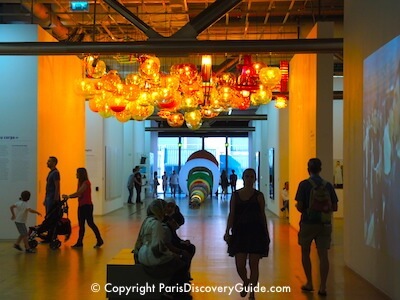 Paris Discovery Tip: Due to massive crowds of visitors, you'll need a strategy to get the most out of your visit to this museum, but don't worry - there are several excellent options. 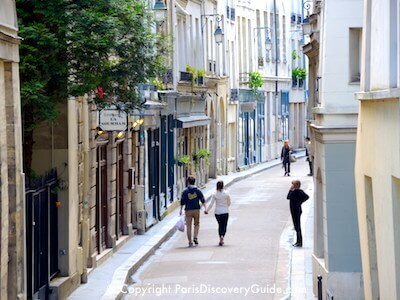 To experience an older Paris, spend some time discovering the charms of the Latin Quarter. First settled by Romans in the 1st century, and then the heart of the city during medieval times, this famous Left Bank neighborhood has long attracted bohemians, scholars, and political protest. 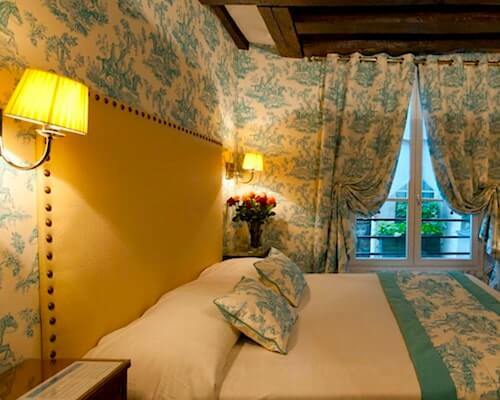 Have a drink at the brasseries along Boulevard Saint Germain where Hemingway, Sartre, and Camus hung out during the 1920s, visit the tombs of French heroes and intellectuals at the Pantheon, and gaze at the timeless beauty of Lady and the Unicorn tapestries at the Cluny Museum. More to Enjoy: Explore the narrow winding side streets filled with old bookstores, tiny bistros, and quirky boutiques. Visit the beautiful old churches filled with artistic treasures, including Saint Julien le Pauvre, dating back to the Middle Ages. Go back even farther in time and visit a 1st century Roman arena, one of the Latin Quarter's "hidden treasures." Paris Discovery Tip: Unless you love huge crowds, avoid pedestrian-only Rue de la Huchette. The Seine River flows through central Paris, defining the city's Right Bank to the north and the Left Bank on the south. Île de la Cité, one of two small islands in the middle is the Parisii first settled about 2,300 years ago. You can enjoy the Seine in many different ways. Walk along the banks and admire the beautiful bridges. Check out les bouquinistes, the riverside booksellers along both sides of the Seine. Explore the Parc Rives de Seine, the riverside pedestrian-only promenade from Place de la Bastille to the Eiffel Tower. Cruise up and down the river on a tour boat to see Paris's most beautiful historic buildings and bridges from a unique perspective. Dine and dance on a river-side barge. Cool off in a floating swimming pool. Visit Les Berges, the recreational area along the river on the Left Bank - it especially comes alive in the summer. More to Enjoy: From mid-July to mid-August, Paris Plages transforms the Right Bank plus other parts of the city into a sandy beach. Paris Discovery Tip: From the Seine, cruise up through the 15th century Canal Saint-Martin and Canal de l'Ourcq through the newly-trendy northeast part of the city. Once a separate village, Montmartre has been part of Paris since 1860 but its winding lanes, many trees, and picturesque hillsides still make it seem like a place apart. You can stroll past the neighborhood's many cafes and cabarets, and imagine the artists, musicians, and writers who made it their home 100+ years ago when rents were cheap. The most famous sight is the gleaming white Basilica of the Sacré Coeur, built in Italian Byzantine style and visible from most points in Paris. Tourists often pack the areas around Sacré Coeur and the Moulin Rouge theater in Pigalle - but miss the most interesting parts of the neighborhood where you can find small art museums and parks, pedestrian-only lanes, and a couple of old-fashioned windmills. More to Enjoy: Go inside Sacré Coeur to see the beautiful mosaics. 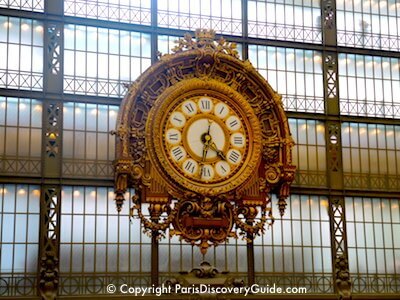 Occupying a former train station, Musée d'Orsay contains a magnificent collection of world-famous impressionist and post-impressionist art. Crowds pack the galleries holding the best-known masterpieces, especially those by Monet, Renoir, Cézanne, Gauguin, and Van Gogh, whose Starry Night painting attracts the largest crowds of all. 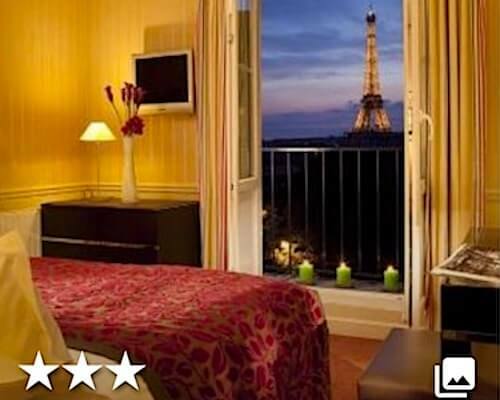 More to Enjoy: Sweeping views of Paris from the rooftop terrace. Paris Discovery Tip: Unless you are visiting during the slow months of the winter, come with a tour group if you want to get a look at the most famous paintings unobstructed by massive crowds. 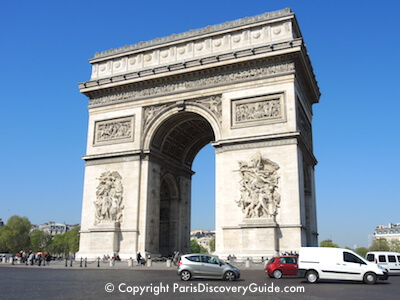 The massive Arc de Triomphe is one of the most recognizable Paris attractions, commissioned in 1806 by Napoleon to honor his army's victories across Europe, although he was exiled and dead by the time of its completion 30 years later. The Arc de Triomphe is surrounded by a busy traffic rotary where 12 grand avenues, including the western end of Champs Élysées, converge. From a distance, the circling traffic somewhat diminishes its grandeur, but it is worth a close-up look. 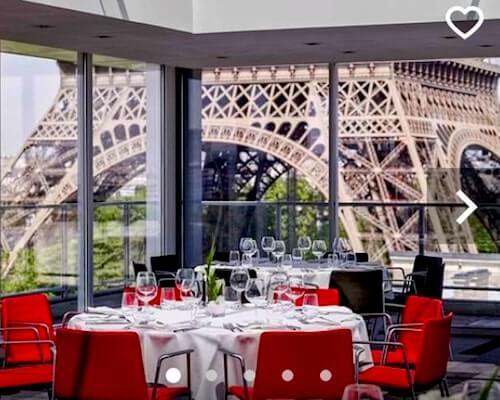 More to Enjoy: Climb the stairs to the observation deck at the top for 360 degree views of Paris. At the base of the monument, visit the Tomb of the Unknown Soldier and eternal flame to honor the unidentified French soldiers killed in World Wars I and II. 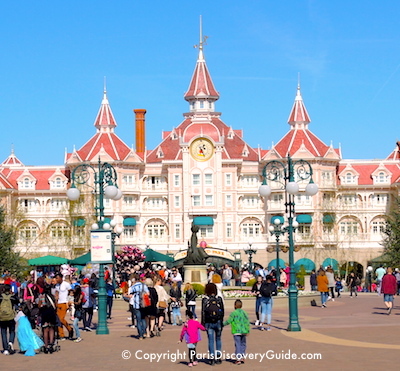 You can see its daily re-lighting every evening at 6:30pm. Elaborate statues and bas relief carvings depicting Napoleon's battles cover large portions of the monument. Paris Discovery Tip: If you are in Paris on Armistice Day (November 11), Bastille Day (July 14), or New Year's Eve (December 31), don't miss the parades and celebrations on Champs Élysées. The Arc is also near the starting point for the Paris Marathon in April, and the finish of the Tour de France in July. In a city filled with traditional architecture, Pompidou Center's edgy design featuring exterior walls of brightly colored tubes and exposed mechanical systems brought howls of derision when it first opened. It still stands out in the cityscape. But inside, revolving exhibitions of top-notch contemporary paintings, sculptures, and video and sound installations account for the museum's immense popularity. Paris Discovery Tip: After your visit, walk around to the back of Centre Pompidou's right side to see Stravinsky Fountain, named after the composer and filled with 16 water-spraying moving sculptures that represent his music. You can also see it if you look straight down from the rooftop deck. 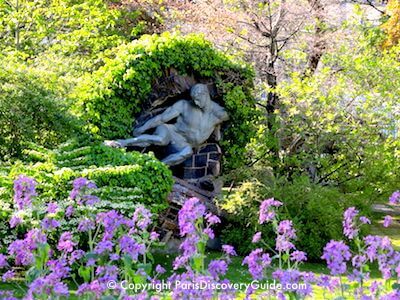 Towering chestnut trees, an expansive pool where children (and teens and adults) float toy sailboats, and many benches for sitting among lush flowers and beautiful statues make Luxembourg Garden the city's most popular park. And with 448 other Paris parks and 2 forests to choose from, that's quite a distinction! Despite the number of visitors, Luxembourg Garden seldom seems crowded because its 60 acres are divided into many distinctive areas. More to Enjoy: A drink or lunch at the open-air cafe. Paris Discovery Tip: If you are traveling with children, check out the pony rides and puppet theater. If you're not, snag one of the green metal chairs next to the reflecting pool at the Medici Fountain and enjoy a few tranquil moments of total relaxation. After you've seen the most famous Paris attractions, what's left?